Nov 18, 2014 - Rabbi Avraham Shmuel Goldberg, 68, of Jerusalem was killed when two terrorists attacked worshipers in a synagogue of the Har Nof neighborhood in Jerusalem the wielding a gun and butcher knives. At 7: 00 on Tuesday morning, two terrorists wielding a gun and butcher knives entered the Kehillat Bnei Torah synagogue on Harav Shimon Agassi Street in the ultra-Orthodox Har Nof neighborhood in Jerusalem. They began attacking worshipers, stabbing them before opening fire. About 30 worshipers were in the midst of the morning prayers, wearing prayer shawls and phylacteries. 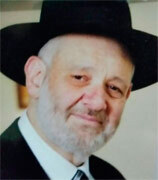 Four people were killed in the attack, among them Rabbi Avraham Shmuel Goldberg. Rabbi Goldberg, a British-born rabbi from Liverpool, was for many years a resident of Golders Green in London and worked in publishing before moving to Israel in 1993. "He was the most wonderful person you could meet, a pillar of the community," said one of Avraham best friends, David Osborne. He added that Avraham prayed at Kehillat Bnei Torah most days for the last ten years or so. "All he wanted was to live a peaceful life. His family are the nicest people you could meet. They had lots of children and several grandchildren." Rabbi Avraham Shmuel Goldberg was buried in the Givat Shaul cemetery in Jerusalem. He is survived by his wife, six children and grandchildren.